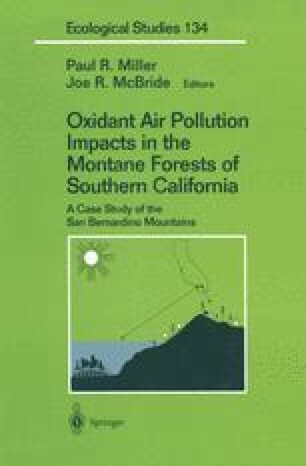 Since the mid-1950s when native pines in the San Bernardino Mountains began to show unexplainable symptoms of decline, the area has been used as a natural laboratory to study the effects of oxidant air pollution on a mixed conifer forest ecosystem. Initial studies in 1963 confirmed that ozone, a major plant-damaging gas in photochemical oxidant air pollution, was responsible for the injury symptoms observed on pine (Pinus ponderosa) foliage and the decline in health of sensitive trees (Miller et al. 1963). Weakened trees were found to be vulnerable to being killed by bark beetles (Coleoptera) (Stark et al. 1968). The increasing number of weakened trees in the forests of the San Bernardino Mountains resulted in extensive sanitation salvage logging during the 1960s and 1970s (Hall 1958).